Real Earth, the pioneer in real-time 3D mapping and localization, secured first place in Microsoft’s Indoor Localization Competition recently held in Vienna, Austria. Real Earth achieved the top ranking through their algorithms embedded in their STENCIL product. It was the only product to perform real time indoor localization without the use of infrastructure. 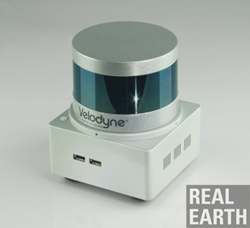 In addition to having efficient algorithms, Real Earth’s success is due in part to use of the VLP-16 real-time 3D LiDAR sensor from Velodyne LiDAR, the worldwide leader in the development of real-time, 3D LiDAR sensors. The Microsoft competition continues to validate Real Earth's technology as the best-in-class and most accurate real-time mapping and localization solution.